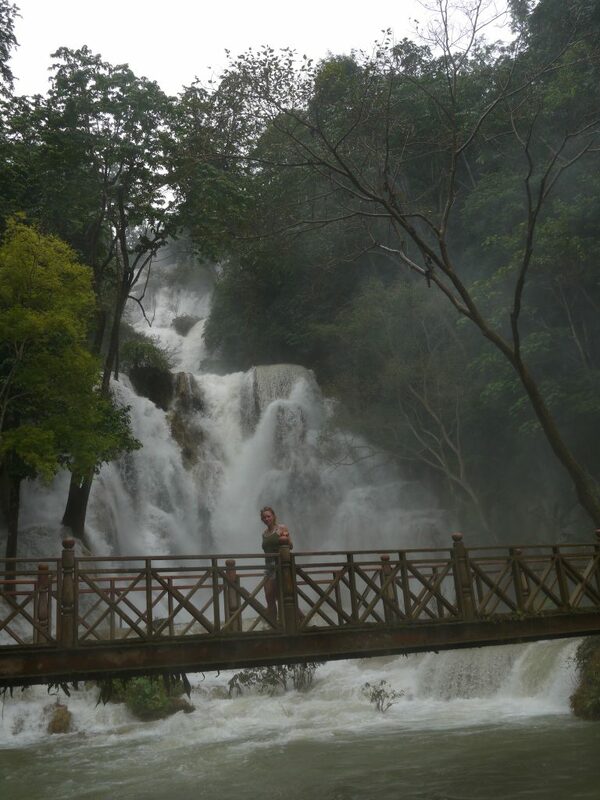 Laos’s Kuang Si waterfall is by far the best waterfall I have ever seen. I just love it when you visit somewhere and you get the WOW factor. It is crazy to feel the power of the water as it drenches you at the bottom with its free-flowing 200ft water off spray, it’s fair to say that it’s the power of nature at it’s finest. The Kuang Si waterfall of _ is a unique place to visit in _, however as the day gets later, more and more and tourists start to pour in to see the unique three pooled rock formations. Furthermore, the Kuang Si waterfall has a sweet mini trek that takes you through the emerald colours river and in between the historic-tall-standing trees. 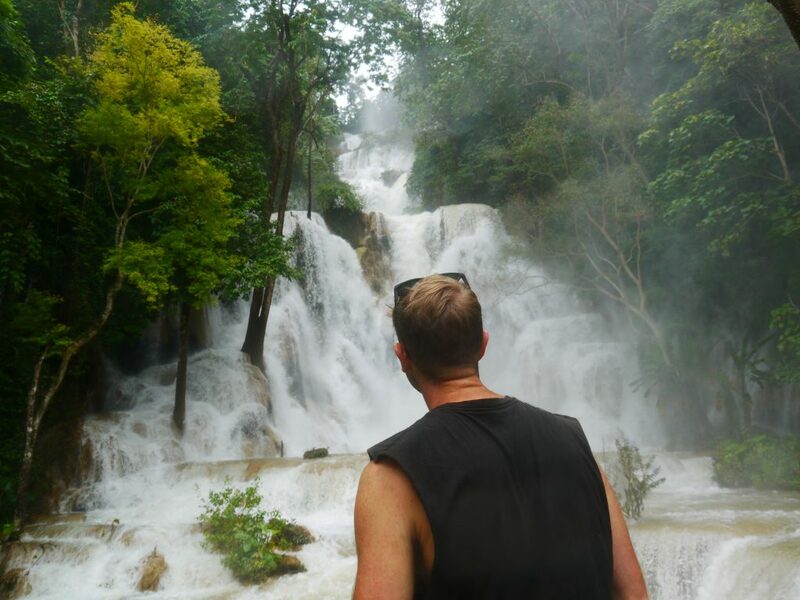 The waterfall is the most impressive thing I have seen in Laos and it’s the number one waterfall I have ever been lucky enough to seen. 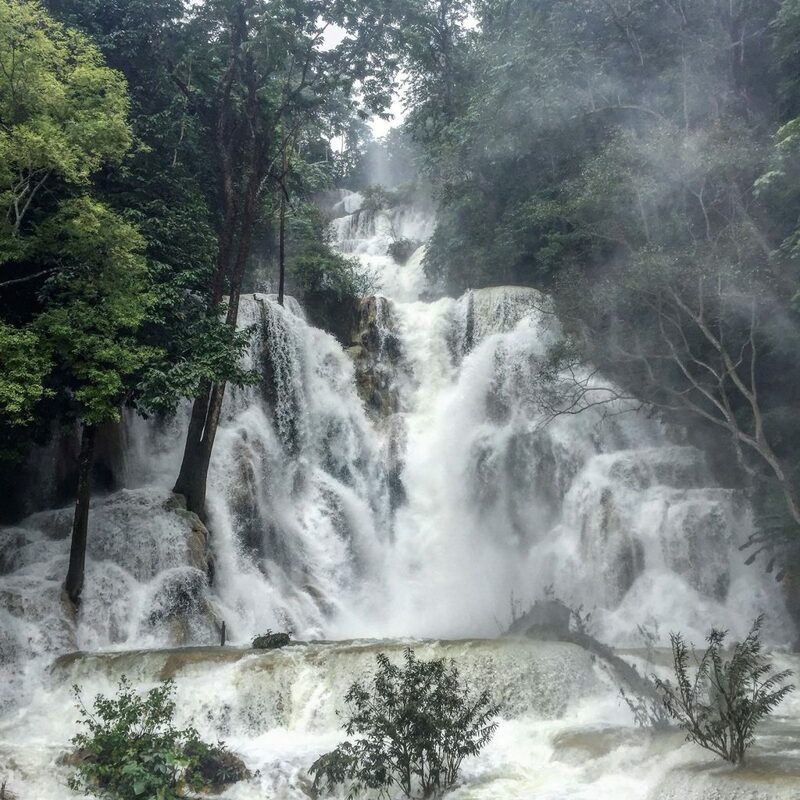 How to get to the Kuang Si falls? 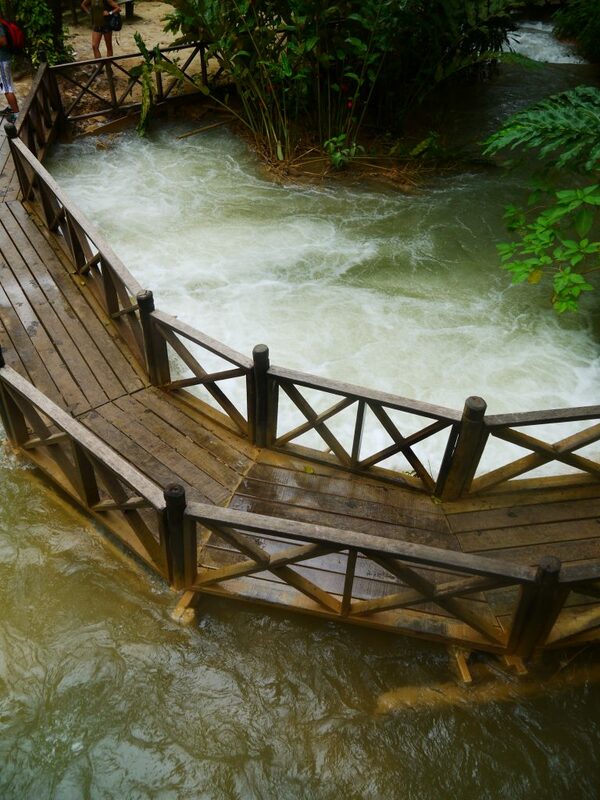 Okay so you have 3 options for how to get to the Kuang Si Waterfall. By tuk tuk, bicycle or my preferred choice a scooter. Each one has pros and cons but the scooter is definitely the best. 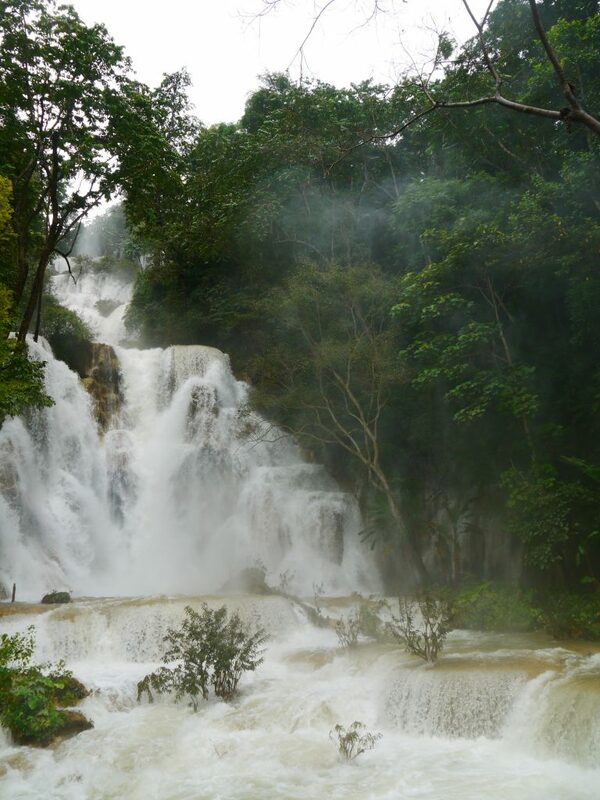 To go and see the Kuang Si falls, we had the crazy idea of cycling there from the centre of Luang Prabang. Luckily enough we changed our mind at the last-minute. Why not cycle? If you would prefer to cycle for over 2 hours including some big hills, then all mean cycle. But it’s going to be tough (I’m all for fitness, but not in this one). 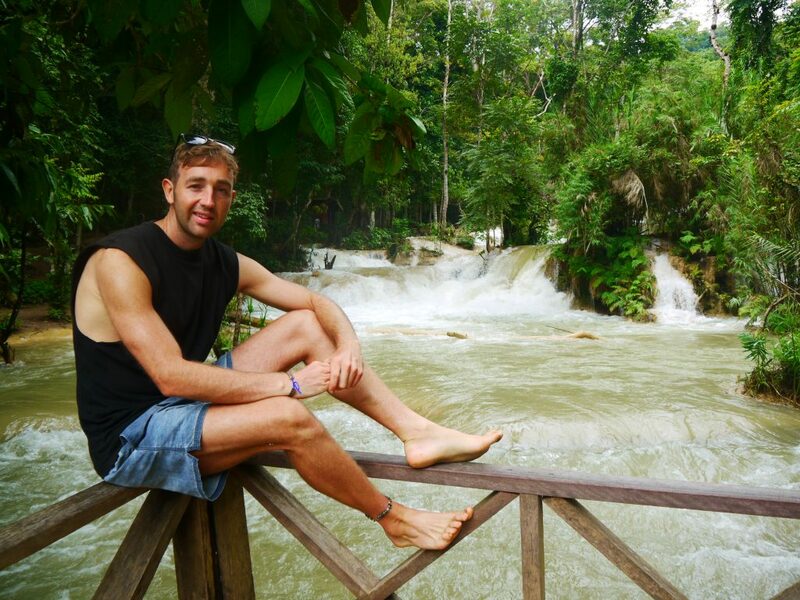 A tuk tuk is a good option and it’s definitely the easiest way of how to get to the Kuang Si Falls. However, this can be a costly option and you will have to use your mastery bartering skills to lower the cost. Furthermore, the cost is going to be dependent on your location. Okay so this leaves the scooters. What’s better than hitting the open road, while the sun beats down on your arms and the wind is providing a cool breeze while you glide through the roads to the Kuang Si Falls. Epic drive and you get to see so many stunning views along the way. You have the freedom of stopping wherever want and when you want. Plus you cover a lot more distance in the hour compared to the bicycle and this is why personally I think the scooter is the better option. The cost of the scooter is 100,000 Kip which is around $12 and you will have to fill it with gas which costs $3 to fill it. It’s mega how cheap the gas is in South-east Asia. Entrance to the Kuang Si waterfalls is 20,000 kip which is roughly $2.50 per persons and I think it’s an absolute bargain of a price for what you get. 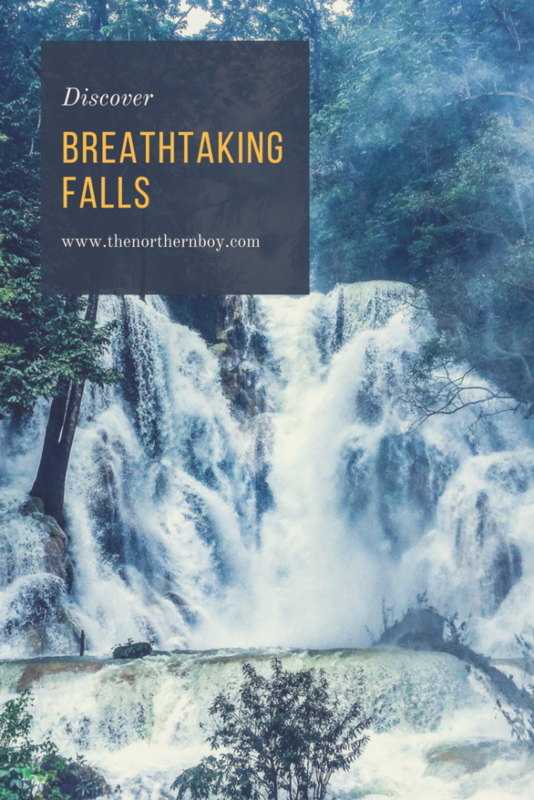 For this you will get full access to the stunning Kuang Si falls and you also get to see the bears of the Kuang Si falls. 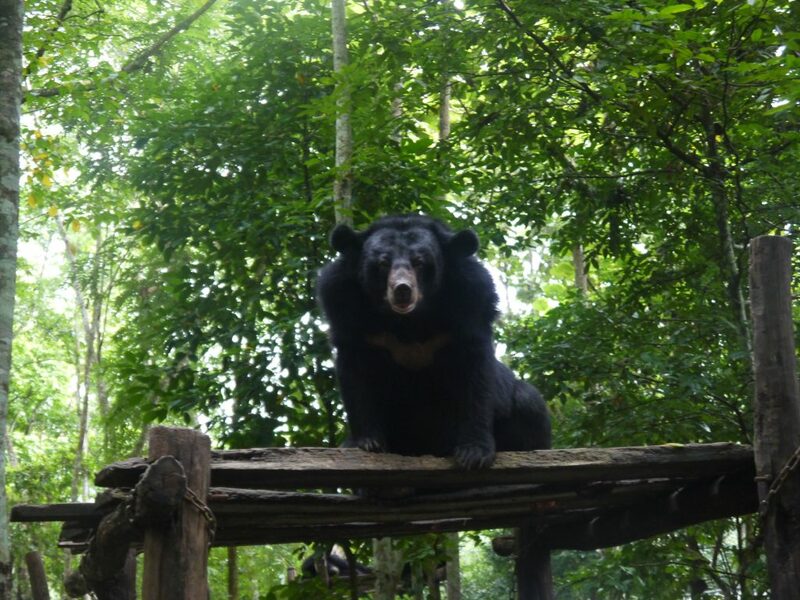 The Kuang Si bear sanctuary is a protection programme for the bears of Asia and it’s a mega experience to be so close to these stunning animals. 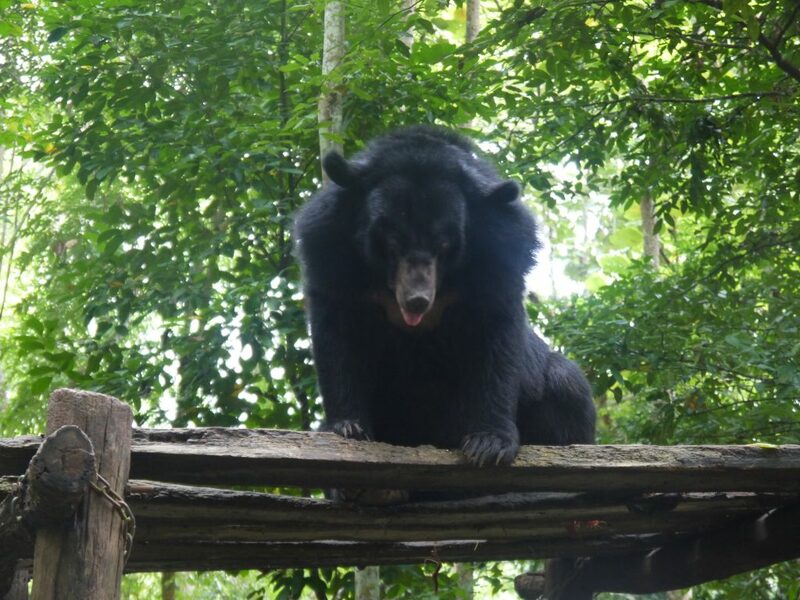 You can literally see the teeth of the Lao bears from just a few meters away. But don’t worry it’s safe. 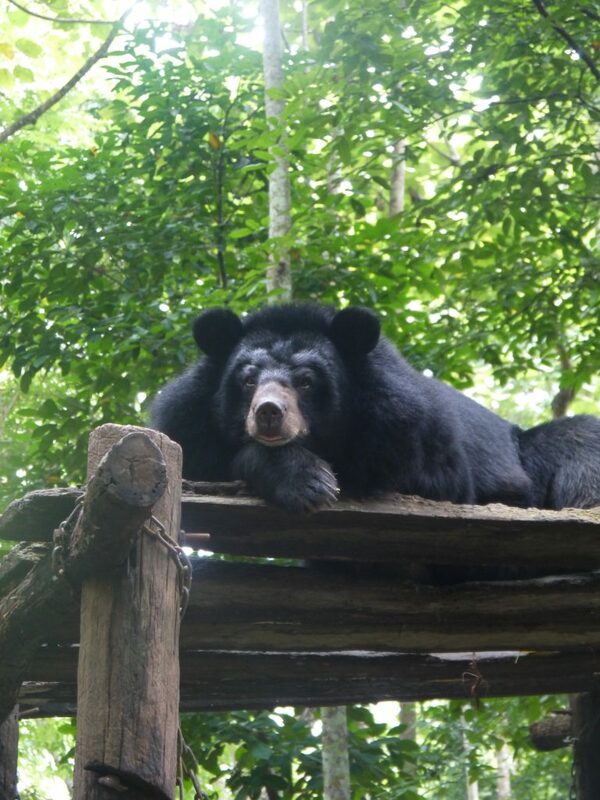 Furthermore, the bear sanctuary it the first thing you will see on the entrance to the Kuang Si falls. As a result, you will have an amazing start to the day with these majestic bears. 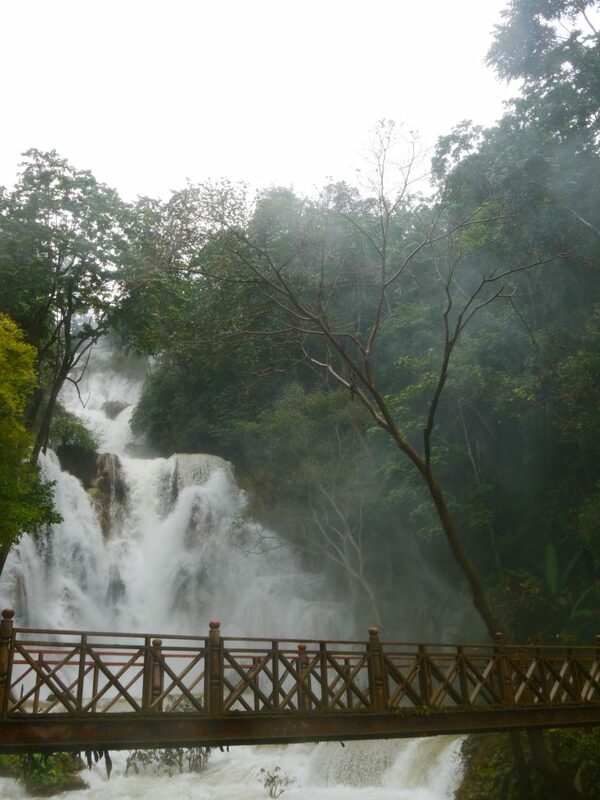 There is parking at the Kuang Si Falls and you should not pay anymore than 2000 kip ($2.50). Is the Kuang Si fall’s water colour turquoise? We turned up to the falls a little sceptical of the colour due to us visiting in Laos’s rainy season of August. And we was right to think that the water may not be turquoise like you see on the Instagram pics. Therefore, during the rainy season you should know that the water will most likely be of a brownish colour. However, due to the rain the Kuang Si Falls are very powerful and it makes for a memorable experience as the water beats down from 200ft up! Who needs turquoise water eh? !